Our range of Ointment Mixer is highly acknowledged for its unique feature like uniform mixing of materials of different densities, viscosities, proportions and shapes, across the industry. Our team of expert engineers specially designed the product in line with set industry quality standards. Our range of Ointment Mixer finds its usage in homogeneous blending and mixing ointments, powder, lotions, Creams and many others. Applications (For Dry Dough Mixing) Promas™ Planetary Mixer is an ideal mixer for the products of different viscosities, densities, shapes proportions. The major uses include the production of latexes, adhesive, personal care cleansing products, dispersion micro-dispersion of chemical agricultural pesticide formulations. It is suitable for mixing/ blending powders as well as thorough mixing of ointments, creams, lotions, toothpastes, resins, slurries, ceramics, colors, pigments, rubber other compounds. Working Principle Promas™ Planetary Mixer consists of a single or double blade with a high speed dispersion blade (Emulsifier / Homogenizer). Intimate homogeneous mixing of products is achieved by planetary motion of beaters centrally located high speed dispersion blade for vacuum jacketed mixer units. The PLM consists of two open beaters moving in planetary motion, scraper blade centrally located high speed homogenizer run by a separate motor to manufacture ointments, creams, suspensions etc. 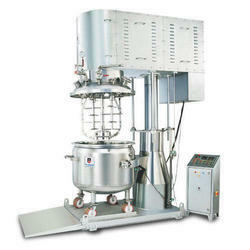 Emulsifier / Homogenizer It is stator-rotor high shear mixer. High speed, high shear higher power are the main characteristics of the stator-rotor mixing device. The high shear action creates a forced product flow. The interchangeability of homogenizer bladed is possible to suit the mixing requirements of various products. They are used in many process operations like Homogenization, Dispersion, Emulsification, Grinding, Dissolving, Chemical reaction, Cell disruption Coagulation. PLM is also used for blending, mixing homogenizing powders of various bulk densities by rectangular shaped or heart shaped (smaller sized mixers) beaters. Jacketed bowls can be provided for heating. cooling of products during mixing. Bowl mounted on castor wheels for easy mobility. Mechanical seal is provided instead of stuffing box for shaft sealing for vacuum operation. Teflon scrappers are provided to avoid localized heating or cooling ensure uniform mixing. Top drive agitator assembly can be lifted lowered by motorized as well as hydraulic systems. Our range of Pharmaceutical Planetary Mixer is highly acknowledged for its unique feature like uniform mixing of materials of different densities, viscosities, proportions and shapes, across the industry. Our team of expert engineers specially designed the product in line with set industry quality standards. Our range of Planetary Mixer finds its usage in homogeneous blending and mixing ointments, powder, lotions, Creams and many others. Applications (For Dry Dough Mixing) Promas™ Planetary Mixer is an ideal mixer for the products of different viscosities, densities, shapes proportions. The major uses include the production of latexes, adhesive, personal care cleansing products, dispersion micro-dispersion of chemical agricultural pesticide formulations. It is suitable for mixing/ blending powders as well as thorough mixing of ointments, creams, lotions, toothpastes, resins, slurries, ceramics, colors, pigments, rubber other compounds. Working Principle Promas™ Planetary Mixer consists of a single or double blade with a high speed dispersion blade (Emulsifier / Homogenizer). Intimate homogeneous mixing of products is achieved by planetary motion of beaters centrally located high speed dispersion blade for vacuum jacketed mixer units. The PLM consists of two open beaters moving in planetary motion, scraper blade centrally located high speed homogenizer run by a separate motor to manufacture ointments, creams, suspensions etc. Emulsifier / Homogenizer It is stator-rotor high shear mixer. High speed, high shear higher power are the main characteristics of the stator-rotor mixing device. The high shear action creates a forced product flow. The interchangeability of homogenizer bladed is possible to suit the mixing requirements of various products. They are used in many process operations like Homogenization, Dispersion, Emulsification, Grinding, Dissolving, Chemical reaction, Cell disruption Coagulation. PLM is also used for blending, mixing homogenizing powders of various bulk densities by rectangular shaped or heart shaped (smaller sized mixers) beaters. Smaller version of Planetary Mixer is provided with a lifting arrangement for the bowl instead of top drive agitator assembly. Pneumatic system is also available for lifting lowering top drive agitator assembly for smaller version of Planetary Mixers. Spare bowl is provided so (hat maximum production can be achieved without losing production time. Thus the maximum utilization of the basic machine is possible for the regular production.